Eight Kentucky Wesleyan students, one faculty, and one staff member worked with Camp Restore in New Orleans, Louisiana over the course of spring break this year. They were able to work with a local food pantry, restore a house still damaged from hurricane Katrina, and plant trees in the wetland areas in the region. 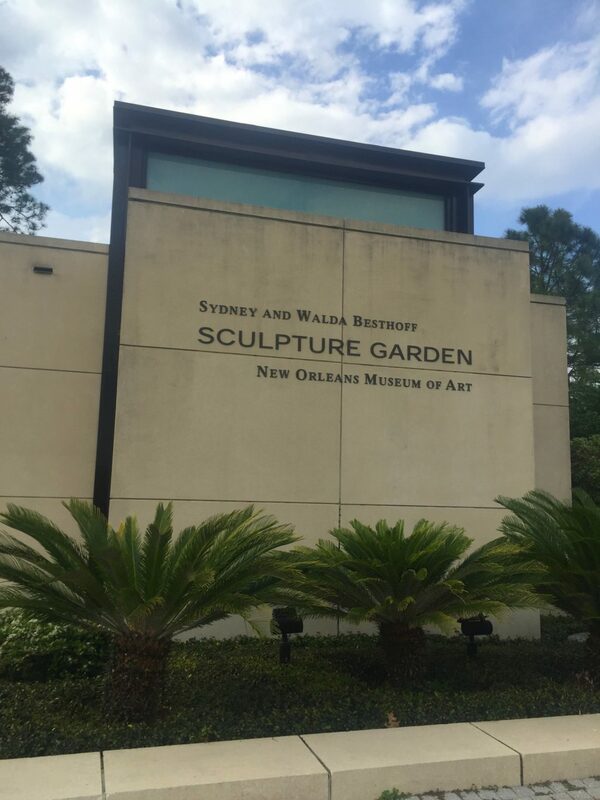 The group also took in the New Orleans experience with a (family friendly) Mardi Gras parade in Metairie, LA, the French Quarter, and a local outdoor sculpture museum. Read about their experiences below and checkout the gallery of amazing pictures! The service trip to New Orleans was a great beginning to what I hope to be a lifetime of humanitarian work. I want to join the Peace Corps after I finish my undergrad, so I see all the service work I do now as a precursor to that. My ultimate dream is to begin my own theatre company that has outreach programs nationally and internationally. This trip further cemented the need I see for service work in society and cemented my passion for it. My favorite service opportunity was working at the food bank. I found it heartbreaking to see firsthand the effects of poverty, but also rewarding to see the compassion everyone had. I truly felt my privilege on the trip. We bought some fast food one day after working on a house and for some reason while eating it I wanted to cry. It really put in perspective the absolute privilege I had to pay for my meal and even be on the trip. I have enough time to give back to others, which in itself is a privilege. Overall, it really taught me that since I have privilege I should do my very best to give back. The service aspect of this trip was something that I can clearly picture; each day was something different than the last and I didn’t see any one individual more than once. Also, every day we experienced different economic and cultural background of people which made the time seem to go by way to fast. The opportunity to meeting people who lost their house in both Hurricane Katrina and the resent tornado, people who moved to New Orleans from other countries to live the American dream, and people that were just giving their time to the community. Monday would easily mark as my favorite day of service since it impacted people personally. On Monday, we worked a food pantry in a large community just outside of New Orleans. My role included spending my time with every person and make sure everything went smoothly. I appreciated that because it gave me chance to learn about their personal history and daily life in New Orleans, but also gave me the chance to tell them about mine. I remember meeting this one older gentleman that moved to the city a month before Hurricane Katrina, resulting in him losing everything that he brought with him. I can still see his face when he recalled recovering the old letters his late wife wrote him during the time he spent in the military. I don’t think before this trip I could honestly say that I have experienced true heartbreak and grief, but after speaking with him I now experienced it. I was able to experience a whole new culture than what I was used to. I gained a new perspective on people who are affected by natural disasters. I learned that there are people who are still affected by Hurricane Katrina. My favorite service opportunity was planting trees in the wetlands. We were able to do something that was not in the city. It was nice to be able to help the environment because it was also affected by the hurricane. The service trip to Camp Restore in New Orleans made a great impact in my life. Seeing the people who have been affected by natural disasters and low income solidified to me how privileged I am. There are people who are still affected by Hurricane Katrina over a decade ago because of the loss of their homes or jobs. Not to mention the tornado that swept away houses at the beginning of this month that has only made matters worse for them. We are so caught up in our petty problems that we neglect to see the people who lack even the bare necessities of living. We worked at a food pantry, helped build a house for a woman named Gloria who lost it during Katrina and has been waiting for aid since, we also helped rejuvenate the ecosystem by plating cyprus trees in the wetlands (which had also been affected by Katrina). What amazed me so much about this experience, was that people still lived there because of a deep love of their city and culture. New Orleans is a city filled with diversity and beauty, and I am so grateful I could not only experience Mardi Gras and the French Quarter, but that I was able to know the people who live there and understand their way of life. For me I can’t say there was a favorite task we did, I really enjoyed them all for their own reasons. I loved that I was able to get out of my bubble and serve others who truly needed my help. I would strongly encourage students and peers to serve when they are able, and to look into the alternative spring break trip next year. NOLA is such a beautiful city with a personality like no other. It really is the great American melting pot with unique food, music, art, and character as a result. People have so much pride for their city and yet overwhelming humbleness. Upon arriving at the food bank to do service work, I felt welcomed, inspired, and loved. The sense of community is so powerful in NOLA. People from all walks of life; of every background, age, and color come together to restore the place they call home. I can only hope that more cities, including my own, develop the same spirit as New Orleans. It truly is a community that embraces what makes their culture special. I could tell from our very first service day at the food bank, which was by far my favorite service day, that the people love their neighbors as well as their neighborhood! There was nothing but love and faith in their hearts. By restoring this amazing place it has restored me and my admiration of people and the places they call home! Spending my spring break in New Orleans was mind-blowing and an amazing experience. While down there we saw what happens when a city is hit by a natural disaster like a tornado. Little did we know that the city of New Orleans was also still recovering from hurricane Katrina, which hit about 12 years ago. My favorite service opportunity that we participated in was working in the food pantry. It was awesome getting to help out those who are in need. While working at the food pantry, I had the opportunity to walk around with those who were in need. Getting to talk to people and hear their stories was amazing. It was definitely an eye opening experience. One of the girls I walked around with was about my age, 20 years old give or take a couple of years. She had gotten out of the hospital that morning and was at the pantry getting food so that she and her brother would have something to eat. It shocked me at how young she was, because I always thought it was older people who went to the food pantries. After helping her put her groceries in the car, she hugged me, thanked me for my help and asked if we could pray for each other. I couldn’t help but tear up thinking about how much she had been through and agreed to pray for her. Getting to talk and help those in need was not the only reason I loved working at the food pantry. Getting to see the compassion that those who work at the food pantry have put a warm feeling in my heart. A lot of them knew the people who were coming in for help. The Alternative Spring Break was amazing experience. The volunteer work we did really opened my eyes to see how some people live. Working at the food pantry, working on a house, and planting trees in the wetlands all had a positive impact on me as a person.